* The product images are for reference only. Generic equivalents may also be supplied by alternate manufacturers. How and Where to Buy Xifaxanta? Buy Xifaxanta online through Canadian Pharmacy World at the amazing discounts. Our Canadian Pharmacy offers RX and OTC medications online and over the phone from suppliers in Canada as well as other countries around the world. For more information and further details, please call Customer Service at 1866-485-7979. Are there Alternative Names for the Brand and Generic Xifaxanta? The Xifaxanta comes from UK and is manufactured by Norgine. 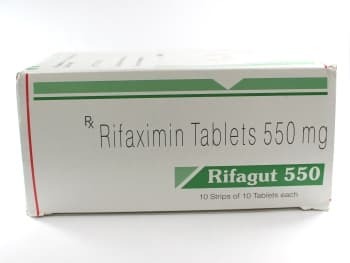 The generic Rifaximin comes from India also called Rifagut manufactured by Sun Pharma and Rixmin manufactured by Sun Pharma. We may sometimes carry the generic from India also called Rcifax manufactured by Lupin and Sibofix by Dr. Reddys. What Dosages and Forms is Xifaxanta available in? Xifaxanta is available in the strength of 200 mg, 400 mg, and 550 mg tablets. What is Xifaxanta used for? Xifaxanta (Rifaximin) is an antibiotic medication that fights bacterial infection only in the intestines. It is used to treat diarrhea caused by the common bacteria knowns as E. coli. It may also be used to prevent a brain problems caused by liver disease. Rifaximin works by stopping the growth of bacteria. This medication does not work for viral infections such as the common cold and flu. What are the Possible Side Effects of Xifaxanta? Are there any Precautions and Drug interactions for Xifaxanta? You should not take Xifaxanta if you are allergic to Rifaximin or if you have any other allergies. Before you start taking this medication, talk to your doctor about your medical history and about all the medications you take including OTC and herbal medications. This medication should not be used during pregnancy unless it is clearly needed. It is unknown if this medication passes into breast milk. There may be an interaction between Xifaxan and other medications such as cyclosporine, azithromycin, clarithromycin, erythromycin, amiodarone, carvedilol, diltiazem, ranolazine, verapamil, etc. Xifaxanta should be stored at room temperature away from light and moisture and out of reach of children and pets. Do not store this medication in the bathroom.